I have been eagerly anticipating the day that I could finally start posting gift guides on the blog--and that day has arrived, my friends. Nothing puts me in the holiday spirit quite like organizing these specialized gifting guides. To start this series off, I wanted to compile a guide for a very unique bunch of people in the world: the literary lovers. We all know at least one of them, and many of us (myself included) categorize ourselves as part of the book lovers club. While the obvious present for this group will always be a good book, it can be difficult to discover more creative gift options. Never fear; that's why I'm here (and on Black Friday, of all days)! A classic book is wonderful, but we literary lovers will appreciate a gift card just as much. Also, most of us are prone to lounging around while reading a gripping novel, so fuzzy socks, comfy pillows, and unique mugs (for steaming hot drinks) are both thoughtful and useful gifts. It's a win-win! 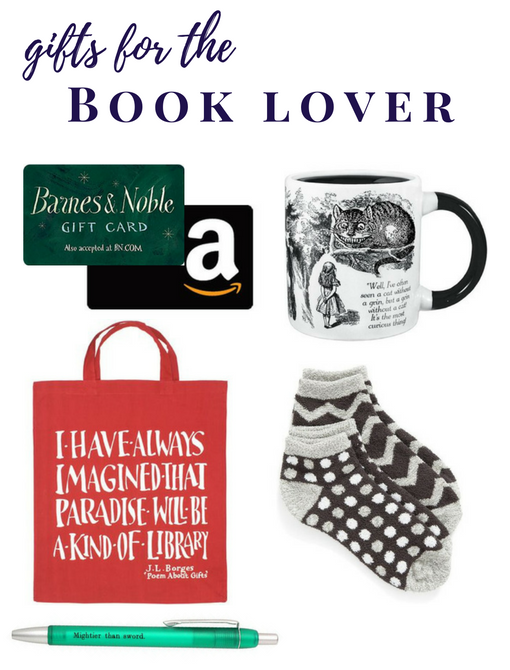 What other gifts do you think are perfect for book lovers?